I am a working futurist, technology strategist and graduate student in the Strategic Foresight program at the University of Houston. Professionally, I also work in technology product marketing and strategy. I am active in futurist organizations and lead the Arizona chapter of the World Future Society. I am also a member of the Association of Professional Futurists and the World Future Studies Federation. My primary interests include the ethical issues and transformative potential of emerging technologies; the impact of robotics and automation on our society and our organizations; the study of scenario methods, storytelling and the creation of positive future models; economics and sustainability; but also much more. Academically, I have an MBA in International Management from Arizona State University and a BA in English from Illinois State University. I am based in Phoenix, Arizona. If you want to learn still more about me, visit my LinkedIn profile. I welcome any and all connections. You can also follow me on Twitter. “Kiteba” is an acronym for Knowledge, Ideas, Technology, Ecology, Biology, and Architecture. It’s a word that combines an integrated set of obsessions I have at present in regard to, again, the future. Changes and advances in these areas are converging at a rapid pace, promising to impact everything from our social existence, to how we learn and communicate, to even the material composition of the planet. Kiteba is a path to a variety of opportunities for a good future. From what I can tell, all positive possible futures involve some combination of the Kiteba elements. Kiteba is a kind of magic formula. Mixed with courage and determination, good, integrated Kiteba work may just mitigate the looming disaster inherent in all the negative trends we see developing for our species and planet. Kiteba is also about the interdisciplinary mind. Being a generalist. Borrowing ideas and innovating new ones. Ideas and works that defy categories. Redefining models and systems. It means learning and thinking, creating and doing. The blog is about my thoughts on all this stuff and more, but I welcome guest articles that might fit. Contact me if you’re interested. 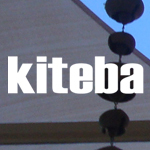 Kiteba also exists as a non-profit organization dedicated to supporting projects for positive futures. Please fill out the contact form here if you are interested in more information. One of the projects in slow motion is a co-working space, either physical, virtual or both that supports workers and projects in foresight or futures. Please fill out the contact form here if you are interested in more information. Please fill out the contact form here to get in touch!